No one knew how to grieve like the Victorians. The elaborate and often downright weird rituals of the era – inspired by Queen Victoria who publicly mourned her husband’s death for forty years – provide a fascinating look at a culture for whom death was ever present. In the United States, losses from the Civil War eclipsed 600,000 deaths, or two percent of the entire population. Death was everywhere. Mourning was an art form. Widows dressed in black from head to toe for an entire year. Household mirrors were covered and clocks were stopped when a death occurred. Women created and wore intricate jewelry made from the hair of the deceased. And rural cemeteries were established across America. 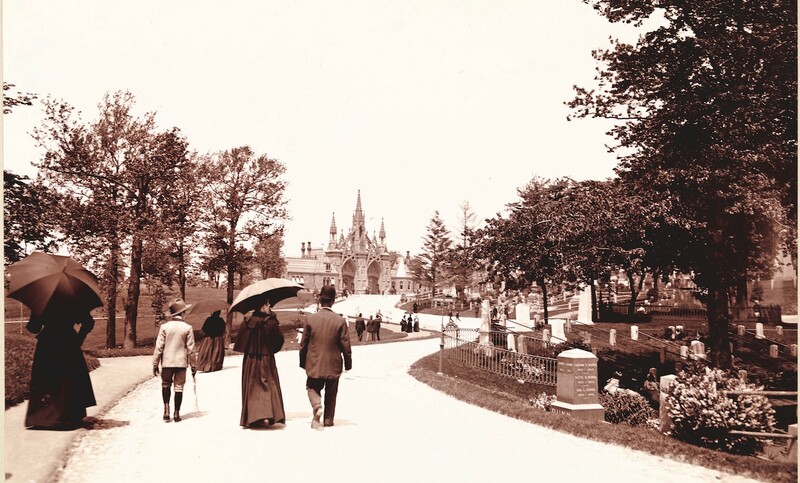 Green-Wood is one such example, which by the 1860’s drew over 500,000 visitors a year who came to see the cemetery’s collection of ornate monuments and mausoleums. Join us for an afternoon symposium devoted to exploring the arts and culture of Victorian mourning with illustrated talks and show-and-tell presentations of period artifacts. Speakers will include Dr. Stanley Burns, M.D., founder of the Burns Archive of photographic history and professor of medicine and psychiatry at NYU Langone Medical Center, Green-Wood Historian Jeff Richman, Evan Michelson, co-owner of Obscura Antiques & Oddities and host of the Science Channel’s Oddities, funeral director Amy Cunningham, Jessica Glasscock, Research Associate for the Metropolitan Museum of Art’s “Death Becomes Her” Exhibition, and more! This symposium is organized in partnership with Joanna Ebenstein, co-founder of the former Museum of Morbid Anatomy and Laetitia Barbier, former librarian of the Museum.